Yes I’m afraid that this is yet another post about Oscar fashion!!!…. Well what can I say! I’m really excited about it and can’t wait till tomorrow… I mean it’s the biggest Hollywood night right?!!! I wanted to post about Cher today…. she has been in almost every worst dress list there is, and I thought that her outfits deserve a post all by themselves!! !… I personally don’t think that Cher should be on a worst dress list…. Cher only dresses like Cher and should be in a Category on her own… Simply because she never wanted to make fashion statements, she wanted to make Statements!! !…..She has been here before all the Gagas and the Minages were even born!!! Here’s to you Cher and to your crazy outrageous outfits! A reader pointed out that Cher’s 1st Oscar appearance was in 1968… so I am up-dating this now… I must say that she looked really cute in Pink! In 1973, Cher wore the first of many memorable Cher Oscar outfits designed by non other than Bob Mackie! In 1974, Cher attended the 46th Academy Awards this time without Sonny. Cher wore a reserved long dress at the 1983 Annual Academy Awards…… However, with Cher being Cher, the outfit was of course still very lavish, and transparent. Cher was nominated for ‘Best Supporting Actress’ for her role in ‘Silkwood’ at the 56th Annual Academy Awards. Cher managed to steal the limelight at the 1986 Academy Awards by wearing this memorable Bob Mackie outfit…..She apparently wore this outfit because the “Academy” failed to nominate her for her highly-acclaimed starring role in the 1985 hit “Mask.” It worked well because the outfit is undoubtedly one of the most famous Oscar dresses of all-time. 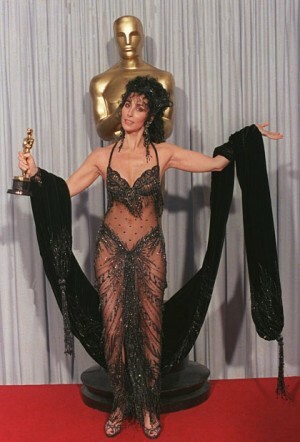 The 60th Annual Academy Awards, hosted in 1988, witnessed Cher winning the ‘Best Actress’ Award for her role in “Moonstruck!” This outfit is again one of the most memorable one’s in Oscar history. The 61st Annual Academy Awards saw the previous years’ ‘Best Actress’ Oscar-winner return to present the ‘Best Picture’ Award. She walked the red carpet with then-boyfriend Rob Camiletti in a short black dress. Nearly a decade after her last visit to the Oscar’s, Cher attended the 70th event with son Elijah Blue Allman, whilst sporting a flesh-coloured dress. In 2000, Cher attended the 72nd Annual Academy Awards to present the ‘Best Original Song’ Award… From all her outfits this is my least favorite one… It reminds me of Angelina Jolie’s Morticia Addams outfit also worn in 2000!!! I hope that we’ll be seeing Cher at the Oscars again some day!!! This entry was posted in Fashion and tagged cher, oscar by mia0909. Bookmark the permalink. Long live C H E R!!! LOve her!! !